Cruising the Panama Canal is a once-in-a-lifetime experience reserved for only the most determined travelers. While anyone is allowed to go, 14-night itineraries and pricey one-way airfares have a way of weeding out many potential cruisers. Retirees with a lot of money and time to spare make up the largest part of this cruise audience. The Panama Canal’s cruise season runs from late September through April. The best time to visit Panama is in the winter and spring, especially since the country’s rainy season lasts from March through December. For the best weather, cruise after November. 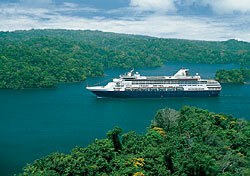 Cruisers have two choices when selecting a Panama Canal itinerary: full crossings and partial crossings. On a full crossing, the ship sails all the way through the canal with guests onboard. On a partial crossing, the ship enters the canal, then lets guests off for shore excursions, but never crosses to the other side. 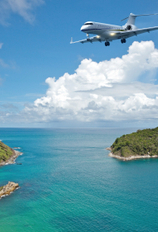 How can you tell if an itinerary contains a full or partial crossing? Check the embarkation and disembarkation ports. If they’re the same (or at least on the same ocean), you’ll only go partway. If you board the ship on the East Coast and disembark on the West—or vice versa—you will definitely travel through the entire canal. It takes a day to traverse the 50 miles of locks that make up the Panama Canal. On a traditional crossing, guests can watch the scenery as the ship makes its way from ocean to ocean. On a partial crossing, ships often stop in Colón or Gamboa, where cruisers can take tour boat rides on the canal or visit the observation center to watch the locks in action. Such activities are also possible on full crossings. The majority of Panama Canal cruises sail between Miami or Ft. Lauderdale and San Diego, Los Angeles, or San Francisco. A few start as far northeast as New York and end as far northwest as Vancouver. Itineraries vary in length and ports-of-call, but most include several stops in [% 2300638 | | Mexico %] on both the Pacific and Caribbean coasts. Additionally, ships may visit ports in Central America and the Caribbean. Puntarenas, on Costa Rica’s Pacific coast, gives cruisers a chance to explore the jungle on horseback, raft, or foot. On the eastern shore, Puerto Limon offers kayaking, off-road adventures, and zip-line canopy tours. The fortified city of Cartagena, Colombia, is known for colonial architecture and beautiful beaches. Visitors can tour the [%1608879 | | Mayan ruins %] of Tikal and Copan in Guatemala, and explore volcanoes in Nicaragua (in Spanish only). Which cruise lines sail through the Panama Canal? Celebrity: Celebrity offers 14- and 15-night cruises on the Celebrity Quest, Infinity, Mercury, and Summit departing from Acapulco, Ft. Lauderdale, Los Angeles, Miami, San Diego, and San Francisco. Crystal: Crystal offers 10- to 16-night cruises on the Crystal Serenity and Crystal Symphony departing from Caldera, Los Angeles, and Miami. Holland America: Holland America runs 10- to 36-night cruises from Callao/Lima, Ft. Lauderdale, Los Angeles, New York, San Diego, Seattle, Tampa, and Vancouver aboard the ms Amsterdam, ms Maasdam, ms Noordam, ms Ryndam, ms Statendam, ms Veendam, ms Volendam, ms Westerdam, and ms Zuiderdam. Norwegian: Norwegian runs 13- to 29-night cruises from Barcelona, Los Angeles, Miami, New Orleans, San Diego, and Santiago aboard the Norwegian Crown, Norwegian Dream, Norwegian Pearl, and Norwegian Sun. Princess: Princess offers 10- to 19-night cruises from Acapulco, Ft. Lauderdale, Los Angeles, San Juan, San Francisco, and Vancouver aboard the Coral Princess, Island Princess, Regal Princess, and Sun Princess. 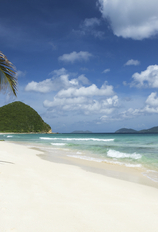 Regent Seven Seas: Regent offers 14- to 16-night cruises from Ft. Lauderdale and Los Angeles aboard the Seven Seas Mariner and Seven Seas Voyager. Royal Caribbean: Royal Caribbean sails 10- to 16-night cruises departing from Ft. Lauderdale, Galveston, Los Angeles, Miami, San Diego, and San Juan aboard the Brilliance of the Seas, Radiance of the Seas, Rhapsody of the Seas, and Serenade of the Seas. For more information about any Panama Canal cruises, contact the cruise line or a travel agent.